In just a few days, Mary will eat food for the first time in 8 years… and that’s because of you. Mary’s life changed last week after having surgery to reconstruct her scarred oesophagus. With your help, she flew from Uganda to Newcastle, Australia for treatment, and she’s now recovering after her 8-hour operation. Mary has endured so much in her young life. She was 15 years old when she swallowed acid at school. Can you imagine the pain Mary must have suffered? Unable to eat food, she’s been kept alive by a feeding tube… but not anymore! Doctors say Mary will eat again soon and she’s already taken her first sip of water in years, which is amazing. Thank you for making it possible. I also want to say thank you to Dr John Christie (pictured above) who arranged the surgeries. The experience has been a little overwhelming for Mary at times. 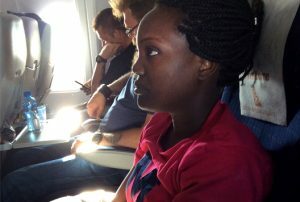 It’s her first time on a plane and away from her home. But she’s doing well after the surgery with lots of smiles. Two other children from Uganda – Benson and Robert – will arrive in Australia in early-June to receive their treatments. There have been a lot of setbacks getting them here, but with your support, we haven’t given up! I’ll keep you updated on their recoveries. Thank you for your financial and prayerful support. One more life has been forever changed.